Whim Biscuit: Musical delights with Nazila love Glamour. Musical delights with Nazila love Glamour. Imagine our delight when we received an e-mail saying that not only had Mr Biscuit and I won tickets as part of a beauty bloggers competition to the highly acclaimed 'Ghost- the musical' in the west end, but also that we would get to have a unique and magical manicure courtesy of Nazila Love Glamour whilst sipping champagne cocktails- we were ecstatic! Seen on the likes of Judges on 'Britain's got Talent', and the cast of 'Made in Chelsea', Nazila Love Glamour nails are the epitome of glitz and glam, often encrusted with jewels and decorative items, the designers behind the brand made an exclusive set to tie in with 'Ghost- the musical' and the theatrics of it all. Arriving at the theatre receiving our cocktails in the exclusive bar, we glimpsed the cast and crew warming up for that evenings performance, and noted the stiletto-shaped nail given to the nail design that is so on trend at the moment after being spotted on Rhianna and Jessie J. The manicure, whilst carried out by leading professional nail-technicians, seemed simple to apply and we were assured that with a coat of good nail-glue, the designs could stay-on for up to two-weeks. Indeed, with people not used to false-nails, they could easily be filed-down and shaped to suit. The show of course, to follow, did not disappoint....it was a masterpiece of a performance with strong vocals, magnificent leading stars, and the absolute jaw-dropping stage production backdrops that transport you from a quaint tender moment, to a all singing all dancing wonder. With the lighting and magic of the crew backstage, your view was transformed with visual effects that had the audience gasping and muttering with curiosity....it was like the actors were spirits themselves! As an extra treat, we all even got to go on stage ourselves to meet the cast, and experience how intimidating peering out to a huge theatre would be! In fact, the musical was so spectacular, that we couldn't resist giving you our amazing loyal readers, a chance at glimpsing it for yourselves. 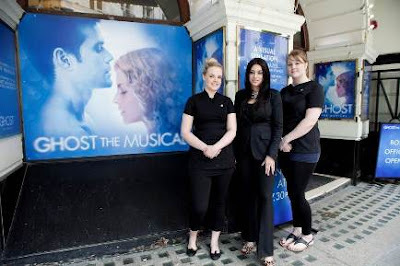 Thus, courtesy of 'Ghost- the musical' in conjunction with Nazila Love Glamour, a lucky follower will receive a pair of complimentary tickets to see the show! All you have to do is RT the competition tweet you will find on @whimbiscuit to win from Friday 25th! The winner will be drawn at random and notified on Monday 28th. 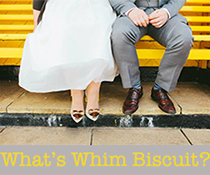 Good luck to our lovely biscuit-eers!